The designer of modern Muslim clothes Kateryna Evdokimova, the founder of the brand Katrin Kym, also took part in this festival. Muslim Women's Social Organisation "Maryam" brought to the show national clothes of the Middle East countries. 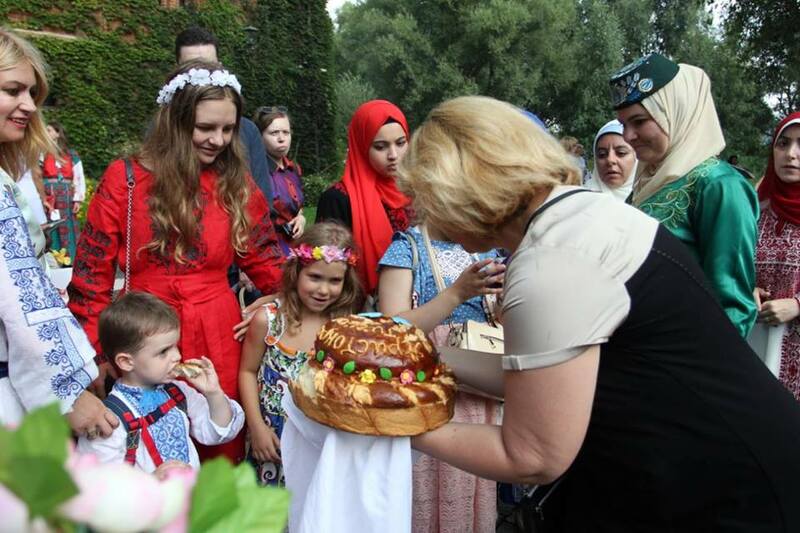 Olga Bogomolets: "Colors and smiles, mood and embroideries, wreaths and hijabs - it was necessary to see!" Not professional fashion models but public activists, successful women, and women contributing to the development of our state demonstrated the looks. This is for the third time when the revived castle Radomysl welcomes the best Ukrainian designers at the All-Ukrainian festival show of ethnic and stylized-ethnic clothes and accessories "Aristocratic Ukraine". A hundred and a half beauties were not only showing clothes decorated with ethnic elements, but they argued that the patrimonial amulets of the peoples that generate Ukrainian political nation are still alive. Therefore, it is not by chance that participants and guests of the ethnic-fashion show saw Palestinian, Syrian, Crimean Tatar and Tatar embroideries, feses and veils, elegant adornment, in addition to the recognizable patterns of embroidered shirts (vyshyvanka), vytynankа and openwork embroidery that are specific in one or another region of Ukraine. 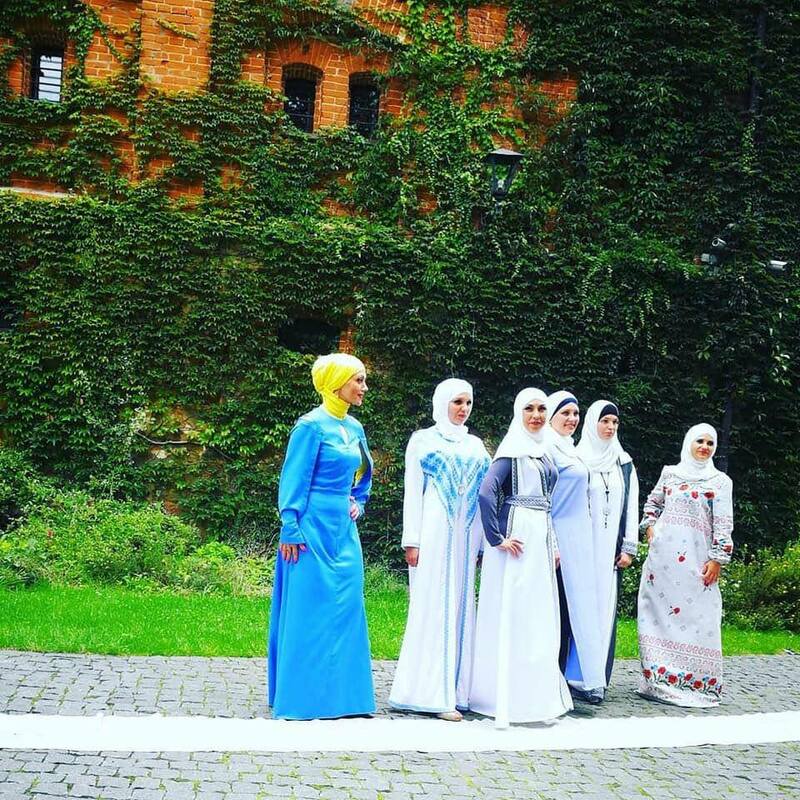 Muslim Women's Social Organisation "Maryam", that is a part of the Civic Society Union "All-Ukrainian Association "Alraid", brought to the show national clothes of the Middle East countries. The guests from foreign embassies and cultural centers of Indonesia, Malaysia and Japan also demonstrated traditional attires. But the Crimean Tatar attires were newer: after the deportation of 1944, the Soviet authorities tried to destroy all references to the culture and traditions of the Crimean Tatars, so the costumes demonstrated to the guests of the "Aristocratic Ukraine" were copied, restored according to the descriptions of museum workers, the found postal cards and illustrations in books, preserved by a miracle in private collections, or according to the smallest elements of clothes that the Crimean Tatars tried to save from liquidation in exile. The show was accompanied by the live music performance of string quartet "Mira" consists of Alisa Rubanova, Kateryna Chechel, Victoria Hanapolska and Olha Zhukova. - While the globalization is consuming the world, when it's hard to distinguish cultures, when everything looks the same, no matter in what airport you arrive, it is very important for each country to preserve its identity and traditions. I am sure that in a few years this festival will not be just all-Ukrainian, but it will international. And the fashion designers will go to us to see our high Ukrainian fashion. Today you will see not just dresses and skirts, but our amulets, which protect us with their ornaments, with their memory, - said the founder of the festival Olha Bohomolets at the event opening. The festival program consisted of three fashion shows. The first one is a fashion parade of models, dressed in authentic attires. During this show original and restored authentic costumes were demonstrated. The second one is a demonstration of modern fashionable clothes and accessories with ethnic-motives, as well as children's fashion parade, which 40 little models took part in. The third fashion show was so called "Handmade" where folk needlewomen demonstrated their works on a par with the best professional designers. - Today (July 28 - Ed.) I had a wonderful day - many months of effort spent on preparing a large-scale cultural event for the revival of national traditions were rewarded in full. The unique ethnic-fashion show "Aristocratic Ukraine", which took place in the "Castle-Museum Radomyshl", was simply incredible! I knew that Ukraine was talented and multifaceted, but I couldn’t even imagine that it was enchanting and fantastic insofar. Colors and smiles, good spirits and embroideries, woodblock printings and laughs, hugs and bare feet, flower crowns and hijabs ... That was sight to behold! Hundreds of esteemers of national traditions - artists and sportsmen, TV personalities and politicians, journalists and scientists - came to see our miracle - Ukrainian and Crimean Tatar ethnic and stylized clothes presented by the best fashion theaters and local designers. The first place in the category "The Best Accessory of the Year" was won by Natalya Hladiy and her flower crowns, demonstrated during the performance of the theater of fashions. The prize for the first place in "The Best Stylized Look" was given to designer Iryna Kovaleva. Said Ismagilov: "A woman should occupy her rightful place in any field of activity"